This bench is awesome. The white is rustic and beautiful. 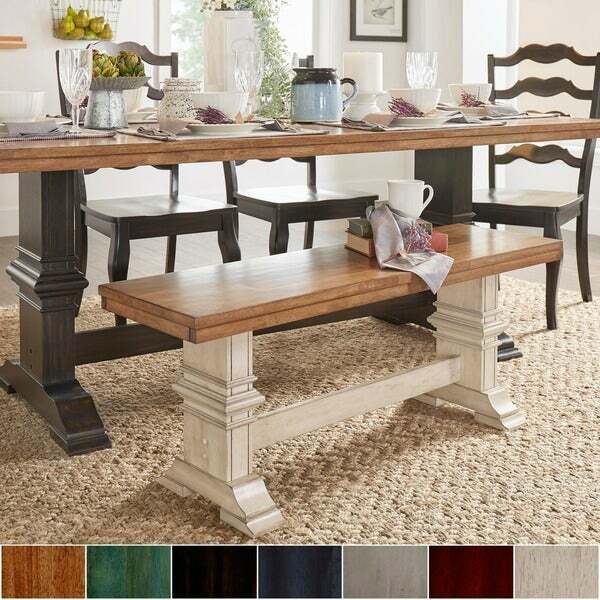 Give your dining room a beautiful and rustic air with this elegant Eleanor wood bench from iNSPIRE Q® Classic. Mix up your seating arrangement and switch out two side chairs for an alternative that's stylish and convenient. Authentic details like a visible wood grain finish and a trestle leg create vintage charm, imbuing a sense of livable sophistication to any dining space. The oak finish bench seat pairs perfectly with your choice of base finish, so you can add a splash of color to your home and express your unique design taste. This product ships in One (1) box. At iNSPIRE Q®, our designer-curated lifestyles reflect current trends and timeless essentials, giving you the know-how to achieve your vision. With diverse style inspirations to choose from, you'll be able to find the one that speaks to you - or mix and match across collections for a style thats all your own. The bench is very nice, my husband put it together easily. It is sturdy and solid. I ordered the antique white but it's more of a grayish color with black distressing. The seat is more of a medium walnut tone. The seat part looked like a medium honey color online. Took a star off for color inconsistency, otherwise beautiful bench. This bench is even better in person! The colors are perfect, and it is extremely sturdy. The bench arrived with a faulty part, but Overstock shipped us a replacement part. Loved the Bench. The whole set looks very elegant. I received the bench yesterday and immediately opened the box. Packaged perfectly. No dents, dings or anything. I just love it. The wood is solid and sturdy. Putting it together was easy for me but I am handy. Take your time and you should be able to put this together in way less than a ½ hr. I did order the table. It hasn't arrived yet but I'm excited now to get it. The picture shows you the bench underneath a 70" table. So it's not a huge bench. It's perfect for our needs. ENJOY!. 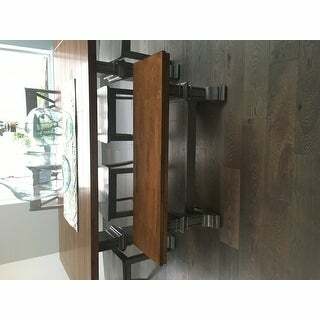 Eleanor Two-Tone Trestle Leg Wood Dining Bench by iNSPIRE Q Classic. Shipped by overstock within the estimated time frame issued. Carrier delivered on time. I bought two of the benches to go with a table I had made. They were perfect. I was shocked how heavy they were. The style was beautiful! I am thrilled with my purchase ! Great buy! 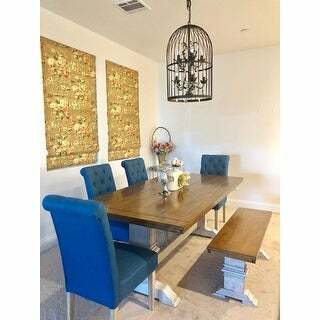 I love this dining set! It was a great price too and very good sturdy quality! I’ve had it for over a year now and get compliments all the time! The bench is the perfect addition too with the chairs! Three kids can sit on it too! This bench is beautiful!! It is a sturdy, solid piece and very well made! It was pretty easy to put together, only took me about 30 minutes. I might actually order another one with the white/cream base for my entryway, as this one is for my dining table. All in all, I highly recommend this bench! My husband and I just put this bench together last night, It is beautiful very well made It isn't light weight, Very Impressed.We had No problems at all putting it together. I sat in floor and was stumped of how to put it together but digging in the box to find the directions was helpful..lol It took about 30mins I have wanted to change up my dining room for a while now, all the wood, hardwood floors, my table and chairs all wood, I had decided I was going to order this bench and I white washed the top of my rustic table.. 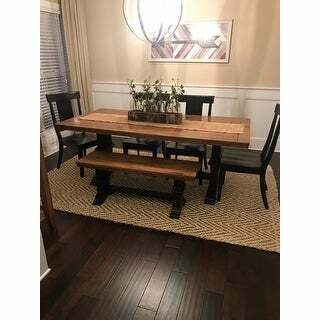 It looks Great so Happy It actually makes the small space appear larger the two chairs that my bench replaced helped along with the light color breaking all the wood tones...Very Pleased You can't go wrong with this bench if you are shopping for one. Bench matches the dining table perfectly! Ordered the grey and oak. This is a very solid piece that complimetns my modern farmhouse look perfectly. Absolutely love it. Absolutely love this bench. It took both my husband and I to put it together. But, the instructions were great and all the parts were there. Beautiful reddish stain, excellent solid construction, easy to put together but easiest with two people (one to hold & one to put the fasteners in). Came with all the parts & in great shape. Strongly recommend. This bench is the biggest reason I purchased this set. 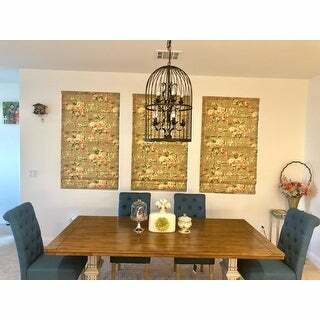 I paired this with four matching Eleanor panel back dining chairs and table, all in oak. The wood is beautiful, looks expensive. The bench is heavy and solid, great for not sliding while sitting. It's perfect! I bought the bench in sage green and love the color. It is a perfect height for the kiddos at dinner. It's much heavier than I thought it would be which is nice. The kids can't scoot it across the rug while eating. This was exactly what I was hoping for. It took a few minutes to put together, but it is extremely sturdy and looks great in my dining room! 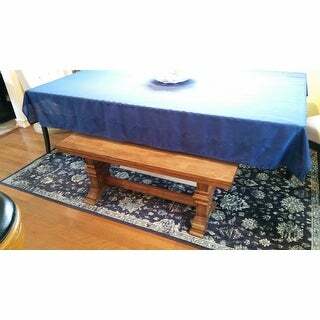 Very sturdy, exactly what we need for extra seating for the holidays or when we put all the table leaves in. Used to store LP crates on top of the rest of the time. 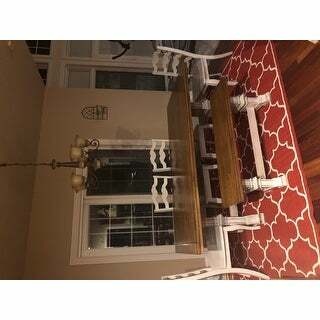 great quality, bought antique white table and 4 chairs and the antique denim bench to accent, looks great, comfortable, amazing, so happy with purchase. We use this as an entryway bench and it has worked out better than expected! Very sturdy and resistance to scratches...withstands kids plopping down to put on shoes and tossing school bags on the bench. "What is the actual finish of the top of the bench? Looking at the antique white for legs but would like to match the top to my current table. " The bench comes with a Oak Finish bench seat. Thank you! "I am in need of a very narrow coffee table due to lack of space. 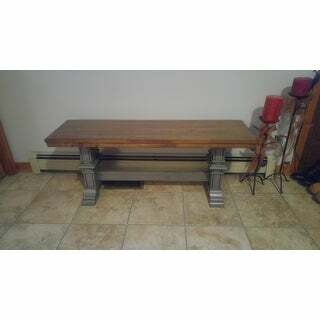 I love the look of this bench and was wondering if it could be used as a table as well? TIA"
We do not recommend it, but it depends on personal preference. "I cannot order the white bottom bench while it is on back order??" This item is estimated to restock in March. "When will the white bottom bench be back in stock?" This is expected to be restocked mid-February. "Will the white bottom bench be back in stock? Thank you." "When do you expect the black base bench to bk in stock? Trying to by the table with matching benches." "How many people can sit on this bench"
The maximum weight capacity of this bench is approximately 250 pounds.